The 1977 Los Angeles Rams season was the team's 40th year with the National Football League and the 32nd season in Los Angeles. Hobbled by chronic knee woes, quarterback Joe Namath was waived by the New York Jets after the 1976 season, after they were unable to trade him. Namath signed with the L.A. Rams in May 1977. Hope of a Rams revival sprung when Los Angeles won two of their first three games, but Namath was hampered by low mobility. After a poor performance in a Monday Night loss to the Bears, Namath never saw NFL game action again. 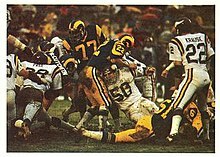 After a home playoff loss to the Minnesota Vikings 14-7 on a saturated field in game which has been termed the "Mud Bowl", Rams head coach Chuck Knox was fired due to ownership's frustration that Knox had not been able to reach the Super Bowl. A football signed by the 1977 Los Angeles Rams, including Tom Mack, Joe Namath, Pat Haden, and Vince Ferragamo. ^ The Super '70s, Tom Danyluk, Mad Uke Publishing, 2005, page 95. The person being interviewed, "LM," is former Rams running back (1972-'79) Lawrence McCutcheon.